You can read this issue on the web at <http://www.schneier.com/crypto-gram-0703.html>. These same essays appear in the "Schneier on Security" blog: <http://www.schneier.com/blog>. An RSS feed is available. Since 9/11, we've spent hundreds of billions of dollars defending ourselves from terrorist attacks. Stories about the ineffectiveness of many of these security measures are common, but less so are discussions of *why* they are so ineffective. In short: much of our country's counterterrorism security spending is not designed to protect us from the terrorists, but instead to protect our public officials from criticism when another attack occurs. 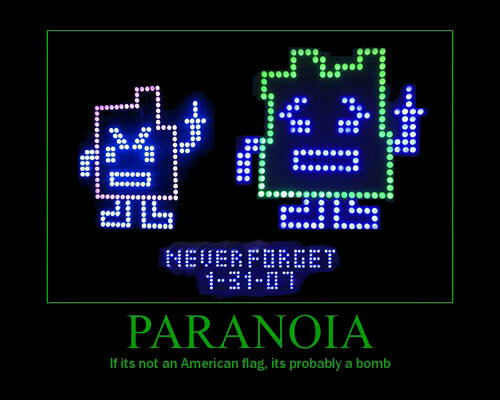 Boston, January 31: As part of a guerilla marketing campaign, a series of amateur-looking blinking signs depicting characters from Aqua Teen Hunger Force, a show on the Cartoon Network, were placed on bridges, near a medical center, underneath an interstate highway, and in other crowded public places. It's called "splash-and-grab," and it's a new way to rob convenience stores. (Okay; it's not really new. It was used on the TV show "The Shield" in 2005. But it's back in the news.) Two guys walk into a store, and one comes up to the counter with a cup of hot coffee or cocoa. He pays for it, and when the clerk opens the cash drawer, he throws the coffee in the clerk's face. The other one grabs the cash drawer, and they both run. Here's another example: On Nov. 24, 1971, someone with the alias Dan Cooper invented a new way to hijack an aircraft. Claiming he had a bomb, he forced a plane to land and then exchanged the passengers and flight attendants for $200,000 and four parachutes. (I leave it as exercise for the reader to explain why asking for more than one parachute is critical to the plan's success.) Taking off again, he told the pilots to fly to 10,000 feet. He then lowered the plane's back stairs and parachuted away. He was never caught, and the FBI still doesn't know who he is or whether he survived. After this story hit the press, there was an epidemic of copycat attacks. In 31 hijackings the following year, half of the hijackers demanded parachutes. It got so bad that the FAA required Boeing to install a special latch -- the Cooper Vane -- on the back staircases of its 727s so they couldn't be lowered in the air. The internet is filled with copycats. Green-card lawyers invented spam; now everyone does it. Other people invented phishing, pharming, spear phishing. The virus, the worm, the Trojan: It's hard to believe that these ubiquitous internet attack tactics were, until comparatively recently, tactics that no one had thought of. Most attackers are copycats. They aren't clever enough to invent a new way to rob a convenience store, use the web to steal money, or hijack an airplane. They try the same attacks again and again, or read about a new attack in the newspaper and decide they can try it, too. In combating threats, it makes sense to focus on copycats when there is a population of people already willing to commit the crime, who will migrate to a new tactic once it has been demonstrated to be successful. In instances where there aren't many attacks or attackers, and they're smarter -- al-Qaeda-style terrorism comes to mind -- focusing on copycats is less effective because the bad guys will respond by modifying their attacks accordingly. Compare that to suicide bombings in Israel, which are mostly copycat attacks. The authorities basically know what a suicide bombing looks like, and do a pretty good job defending against the particular tactics they tend to see again and again. It's still an arms race, but there is a lot of security gained by defending against copycats. But even so, it's important to understand which aspect of the crime will be adopted by copycats. Splash-and-grab crimes have nothing to do with convenience stores; copycats can target any store where hot coffee is easily available and there is only one clerk on duty. And the tactic doesn't necessarily need coffee; one copycat used bleach. The new idea is to throw something painful and damaging in a clerk's face, grab the valuables and run. Similarly, when a suicide bomber blows up a restaurant in Israel, the authorities don't automatically assume the copycats will attack other restaurants. They focus on the particulars of the bomb, the triggering mechanism and the way the bomber arrived at his target. Those are the tactics that copycats will repeat. The next target may be a theater or a hotel or any other crowded location. A new report (long, but at least read the Executive Summary) from the U.S. Department of Justice's Inspector General says, basically, that all the U.S. terrorism statistics since 9/11 -- arrests, convictions, and so on -- have been grossly inflated. The report gives a series of reasons why the statistics were so bad. Here's one: "The number of terrorism-related convictions was overstated because the FBI initially coded the investigative cases as terrorism-related when the cases were opened, but did not recode cases when no link to terrorism was established." And here's an example of a problem: "For example, Operation Tarmac was a worksite enforcement operation launched in November 2001 at the nation's airports. During this operation, Department and other federal agents went into regional airports and checked the immigration papers of airport workers. The agents then arrested any individuals who used falsified documents, such as social security numbers, drivers' licenses, and other identification documents, to gain employment. EOUSA officials told us they believe these defendants are properly coded under the anti-terrorism program activity. We do not agree that law enforcement efforts such as these should be counted as "anti-terrorism" unless the subject or target is reasonably linked to terrorist activity." There's an enormous amount of detail in the report, if you want to wade through the 80 or so pages of report and another 80ish of appendices. The idiocy of this is impressive: "A Vancouver Police computer crime investigator has warned the city that plans for a citywide wireless Internet system put the city at risk of terrorist attack during the 2010 Winter Olympic Games." "'If you have an open wireless system across the city, as a bad guy I could sit on a bus with a laptop and do global crime,' Fenton explained. 'It would be virtually impossible to find me.'" There's also some scary stuff about SCADA systems, and the city putting some of its own service on the Internet. Clearly this guy has thought about the risks a lot, just not with any sense. He's overestimating cyberterrorism. He's overestimating how important this one particular method of wireless Internet access is. He's overestimating how important the 2010 Winter Olympics are. According to a new report, the FBI has lost 160 laptops, including at least ten with classified information, in the past four years. But it's not all bad news. A similar audit in 2002 found that 317 laptops were lost or stolen at the FBI over about two years. The FBI: Now losing fewer laptops! There's a UAC security hole in Vista. What's interesting is that Microsoft is positioning this as a trade-off between security and ease-of-use. That's correct, of course, but it seems that someone made a bad decision in this regard. Slowly, AACS -- the security in both Blu-ray and HD DVD -- has been cracked. Now, it has been cracked even further. As I have said before, what will be interesting to watch is how well HD DVD and Blu-ray recover. Both were built expecting these sorts of cracks, and both have mechanisms to recover security for future movies. It remains to be seen how well these recovery systems will work. Was the TSA website hacked, or was it just incredibly bad webpage design and coding? Real-world back doors: a social engineering test where the attackers entered the building through a back-door left open for smokers. OpenSSL is now FIPS 140-2 certified. The process took five years. This is a major problem with long certification cycles; software development cycles are faster. Is everything a bomb these days? In New Mexico, a bomb squad blew up two CD players, duct-taped to the bottoms of church pews, that played pornographic messages during Mass. This is a pretty funny high school prank and I hope the kids that did it get suitably punished. But they're not terrorists. And I have a hard time believing that the police actually thought CD players were bombs. Meanwhile, the British Police Force blew up a tape dispenser left outside a police station in Northern Ireland. And not to be outdone, the Dutch police mistook one of their own transmitters for a bomb. At least they didn't blow anything up. If you're having trouble identifying bombs, this quiz should help. The Boston police blew up a traffic counter. I'm beginning to think that something is seriously wrong with the police chain of command in Boston. Boston PD: Putting the "error" in "terror." "Windows for Warships." I'm not sure this is a good idea. A related article from 1998, involving Windows NT and the USS Yorktown. There's a rumor about a software bug in the F-22 Raptor stealth fighter. It seems that the computer systems had problems flying west across the International Date Line. No word as to what operating system the computers were running. With all the attention on foreign money laundering, we're ignoring the problem in the U.S. There's good news regarding Canada's anti-terrorism laws. First, security certificates were declared unconstitutional. And second, the House of Commons voted against extending two provisions of a 2001 anti-terrorism law. They expired at the end of February. Very interesting article about Apple's DRM system, which they call "FairPlay." The cost-effectiveness of sky marshals in Australia is being debated. I have not seen any similar cost analysis from the United States. Nothing I haven't said before, only a demonstration of how insecure they are. Some airport baggage handlers used their official credentials to bypass security and smuggle guns and marijuana onto an airplane. This kind of thing is inevitable. Whenever you have a system that requires trusted people -- that is, every security system -- there is the possibility that those trusted people will not behave in a trustworthy manner. But there are ways of minimizing this risk. I'm tired of headlines like this: "New autopilot 'will make another 9/11 impossible.'" Why are people so narrowly focused? The goal isn't to protect against another 9/11. The goal is to protect against another horrific terrorist incident. Stop focusing on the tactics, people. Look at the broad threats. I've written about this particular countermeasure before. "Cameras fitted to seat-backs will record every twitch, blink, facial expression or suspicious movement before sending the data to onboard software which will check it against individual passenger profiles." "They say that rapid eye movements, blinking excessively, licking lips or ways of stroking hair or ears are classic symptoms of somebody trying to conceal something." "A separate microphone will hear and record even whispered remarks. Islamic suicide bombers are known to whisper texts from the Koran in the moments before they explode bombs." "The software being developed by the scientists will be so sophisticated that it will be able to take account of nervous flyers or people with a natural twitch, helping to ensure there are no false alarms." The only thing I can think of is that some company press release got turned into real news without a whole lot of thinking. This isn't unique. Private security guards outnumber real police more than 5 to 1, and increasingly act like them. For example, a federal law known as Section 1983 allows you to sue for civil rights violations by the police but not by private citizens. The Freedom of Information Act allows us to learn what government law enforcement is doing, but the law doesn't apply to private individuals and companies. In fact, most of your civil rights protections apply only to real police. When I posted this on my blog, I got a lot of negative comments from Libertarians who believe that somehow, the market makes private policemen more responsible to the public than government policemen. I'm sorry, but this is nonsense. Best Buy is going to be responsive to its customers; an apartment complex is going to be responsive to its renters. Petty criminals who prey on those businesses are an economic externality; they're not going to enter into the economic arguments. After all, people might be more likely to shop at Best Buy if their security guards save them money by keeping crime down -- who cares if they crack a few non-customer heads while doing it. Schneier is a recipient of the 2007 EFF Pioneer Award, together with Yochai Benkler and Cory Doctorow. As part of BT's Big Thinkers series, Esther Dyson interviewed Schneier and two other people (Risto Siilasmaa, Chairman of F-Secure Corporation; and Michael Barrett, PayPal's CISO) on network security issues. The other interviews in the series are here. Schneier is speaking at Temple Sharey Tefilo-Israel in South Orange, NJ on March 25th. It's nothing more than a homeland security scam: a dowsing rod for explosives. That, and a pump-and-dump stock scam. The Sniffex site is down, but Google has a cache, and they seem to be back as Homeland Safety International. They also have a patent. Cisco says that 77 of its routers are vulnerable. Blog comment: "The attack is called 'CSRF' Cross-Site Request-Forgeries. It's been documented for several years, I remember stumbling on it myself 2-3 years ago, and being very surprised that it doesn't get wider publicity -- that has luckily changed in the past year. It's not only routers, but all sorts of intranet-web applications are open to this line of attack (especially when it's standard-software, or someone has insider-knowledge; and users stay logged in for most for most of the time)." Remember the Cisco fiasco from BlackHat 2005? Next in the stupid box is RFID-card manufacturer HID, who has prevented Chris Paget from presenting research on how to clone those cards. The ACLU presented in his place. Won't these companies ever learn? HID won't prevent the public from learning about the vulnerability, and it will end up looking like heavy handed goons. And it's not even secret; Paget demonstrated the attack to me and others at the RSA Conference last month. There's a difference between a security flaw and information about a security flaw; HID needs to fix the first and not worry about the second. Full disclosure benefits us all.